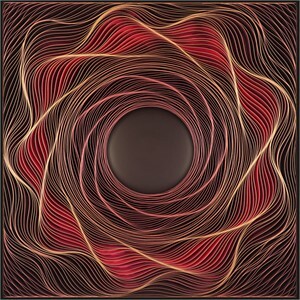 Dallas Design District Gallery, Laura Rathe Fine Art, announces a dual-exhibition, ‘On Different Wavelengths,' featuring new works by Stallman Studio and Chris Wood. LRFA will be hosting the opening reception on Saturday, October 13th from 5:00-8:00pm with artist talk at 6:45pm moderated by gallery owner, Laura Rathe. 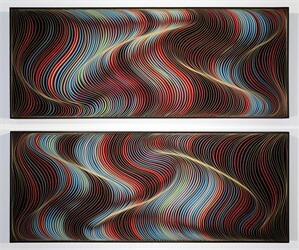 Though their work differs greatly in terms of technique, subject, and medium, Stallman and Wood share an interest in creating dynamic compositions that incorporate energetic forms, patterns, colors, and light. ‘On Different Wavelengths’ will be on display through November 10th, 2018. Represented in five states, Stallman have also exhibited their work around the world, in places such as Singapore, London, Monaco, Dubai, Hong Kong, Korea, and the United States. 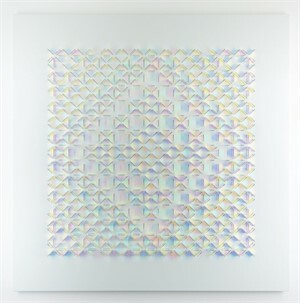 Chris Wood produces Geometric Dichroic Glass installations using her most effective medium ―Light. 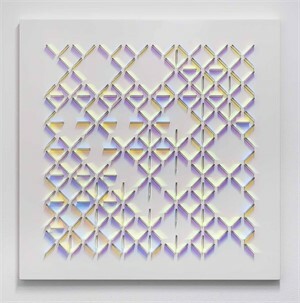 These light sculptures utilize panels of dichroic glass that refract light across an array of colors. Using light to create colorful, prism-like mazes and geometric patterns, the special coating on the glass reflects certain wavelengths of light, producing a rainbow spectrum of shadows and projections. 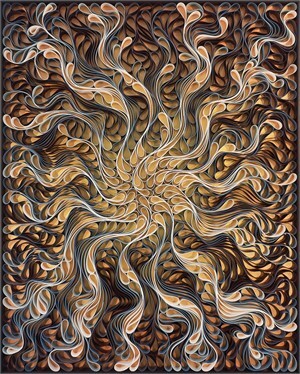 Wood’s work is yet another reflection of the ephemeral glimpsed moments in the natural world. 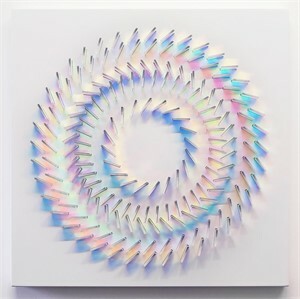 Her sculptures are specifically designed in simple arrangements that create kinetic response patterns determined by the environment in which it is placed. 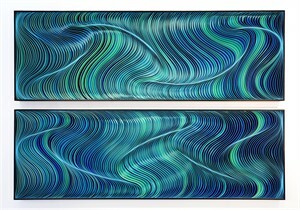 Dallas Design District Gallery, Laura Rathe Fine Art, announces a dual-exhibition, ‘On Different Wavelengths,' featuring new works by Stallman Studio and Chris Wood. 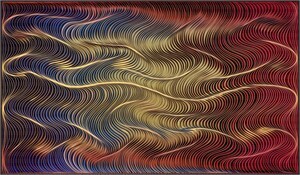 LRFA will be hosting the opening reception on Saturday, October 13th from 5:00-8:00pm with artist talk at 6:45pm moderated by gallery owner, Laura Rathe.Though their work differs greatly in terms of technique, subject, and medium, Stallman and Wood share an interest in creating dynamic compositions that incorporate energetic forms, patterns, colors, and light. 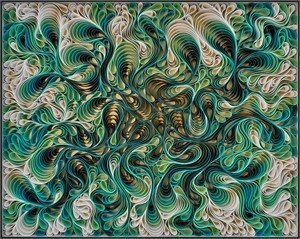 ‘On Different Wavelengths’ will be on display through November 10th, 2018.ABOUT THE ARTISTSStallman Studio Based in the Pacific Northwest, artists Stephen Stum and Jason Hallman (collectively known as Stallman) meld their creative energies to produce mesmerizing works that fall somewhere between the categories of painting and sculpture. 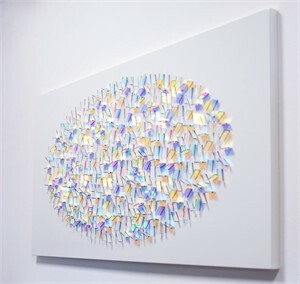 Since 2012, they have collaborated on their Canvas on Edge series, which molds painted strips of canvas into compositions that shift in color and form depending on the viewer’s perspective. 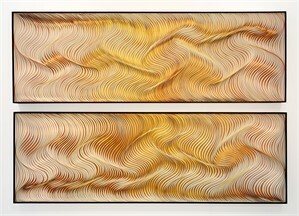 The strips’ painted edges gather to create elevated line drawings that recall cellular processes and organic forms drawn from nature. 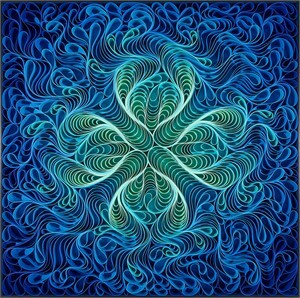 Represented in five states, Stallman have also exhibited their work around the world, in places such as Singapore, London, Monaco, Dubai, Hong Kong, Korea, and the United States. 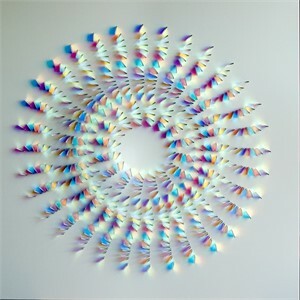 Chris Wood Chris Wood produces Geometric Dichroic Glass installations using her most effective medium ―Light. 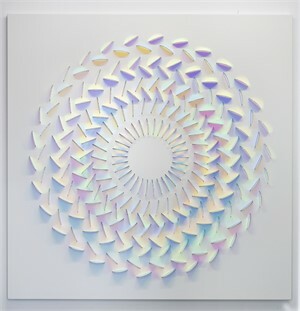 These light sculptures utilize panels of dichroic glass that refract light across an array of colors. 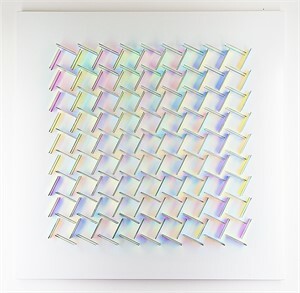 Using light to create colorful, prism-like mazes and geometric patterns, the special coating on the glass reflects certain wavelengths of light, producing a rainbow spectrum of shadows and projections. 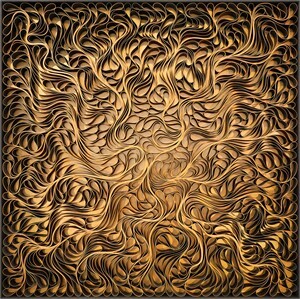 Wood’s work is yet another reflection of the ephemeral glimpsed moments in the natural world. 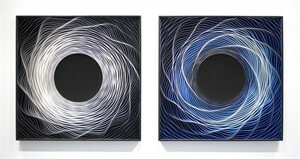 Her sculptures are specifically designed in simple arrangements that create kinetic response patterns determined by the environment in which it is placed.